Add some extra comfort to your seat. Our lumbar support can strap around most any mesh seat. It can be moved around to get your comfort where you want it. 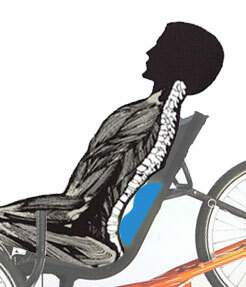 If you would like a simple way to add Lumbar Support to your Recumbent Bike or Recumbent Trike, this is a wonderful accessory. While it is designed specifically for the WizWheelz line of recumbent Trikes, the simple design allows this upgrade for many different Recumbent Cycles. For long rides, daily commuting, or just plain fun, the Utah Trikes Lumbar Support accessory will add the extra comfort you need to keep triking. This Lumbar Support can be adjusted in height so that you can place it at any part of your back for added comfort. Works on all size trikes and on all size riders. Give it a try today!